In our previous article “Hierarchical Design of Verilog” we have mentioned few examples and explained how one can design Full Adder using two Half adders. This example problem will focus on how you can construct 4×2 multiplexer using 2×1 multiplexer in Verilog. A multiplexer is a device that can transmit several digital signals on one line by selecting certain switches. From above figure, we can observe that if we set a switch to 1 then out will have data line A. As (A AND 1 = A) and due to the presence of NOT gate B data will have no effect on output. Hence, we can have our 2×1 multiplexer. 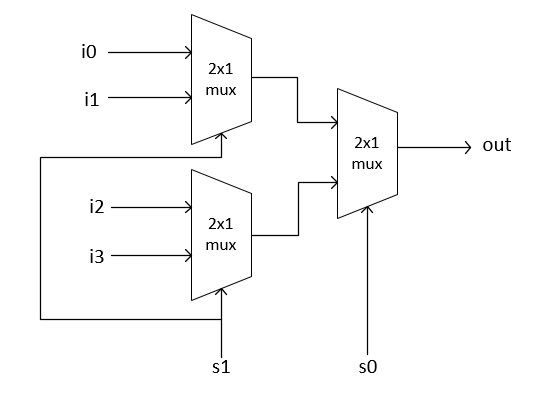 Focus on the diagram of 2×1 mux and you will get it how this 4×2 mux works. Now using hierarchical designing it is very easy to write Verilog code of 4×2 mux by just instantiating three 2×1 muxes. We hope you will find this example interesting, we will keep posting more problems and examples soon. If you have any questions or suggestions please leave us a comment below.